It’s only fitting that we finish up on the show’s 50th anniversary and only fitting that we finish with the guest villainess from our #1 pick in the Top 13 Episode Countdown: Catwoman. Oh, don’t worry, we’ll have plenty behind-the-scenes looks at Diamond’s excellent Batswag (and other companies too) down the line but it’s time to hang the cowl on this series. Part 9. Mr. Freeze. Click here. 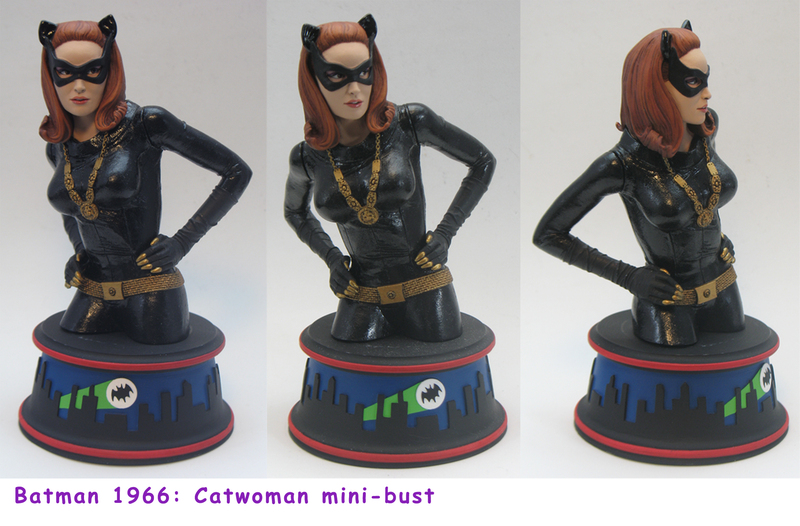 — Julie Newmar Catwoman Statue is Revised with Necklace. Click here. Dan Greenfield: Why this pose? Why mask on instead of mask off? Barry Bradfield: The hands-on-hips pose just felt right to me. After looking through some old reference to see if anything else stood out, it seemed like a good pose to pursue. Her whip was rarely used, and she didn’t take part in the fights, so something like this seemed to fit best. Both mask on and mask off were drawn, just as with Riddler, but the mask on won out. I feel that it frames her face well, unlike Riddler’s mask which seemed almost padded. Her eyes could still stand out in the mask whereas Riddler’s were just lost. Jean St. Jean: DST wanted a seductive, taunting demeanor to capture her confidence and allure. For one thing, having the mask on always leaves the option open to do an unmasked variant, but also adds more of the comic image to the character. I personally always prefer characters with masks. Dan: This is Julie Newmar. But which is your personal favorite Catwoman — and why? 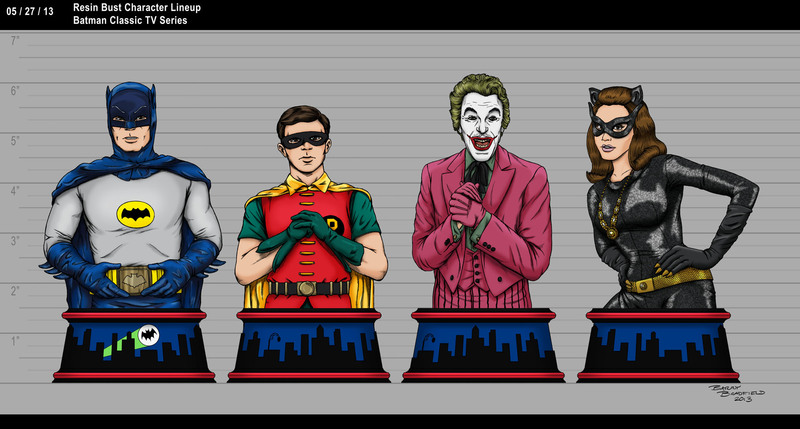 Barry: Out of the three on the classic TV series, I think Julie Newmar is my favorite. She really embodied the character and looked to be having a lot of fun in the role. I loved how she would swap emotions so quickly, being sultry one moment and angry the next, only to return to slinking around a moment later. Jean: Julie was the best Catwoman, but I always really liked Eartha Kitt as well. Julie Newmar looked the best in the costume and really personified the two-faced seductress with a feline style of movement. Dan: Which is your favorite Catwoman episode? Actually she DID take part in bat-fights. In CW2 she pummels robin with a money bag from the rocket. In CW 5 she hits batman with a vase or lamp in the famous seduction scene bat-fight. 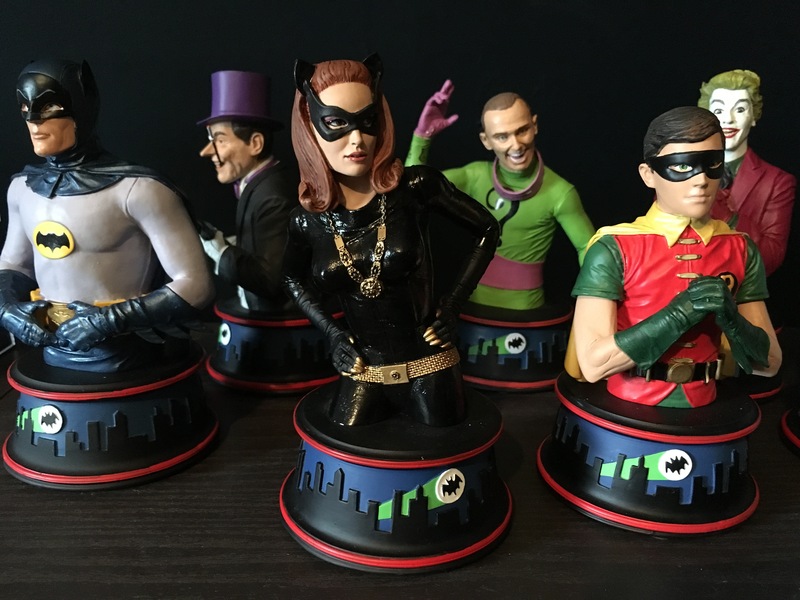 I have all of the busts – love them! 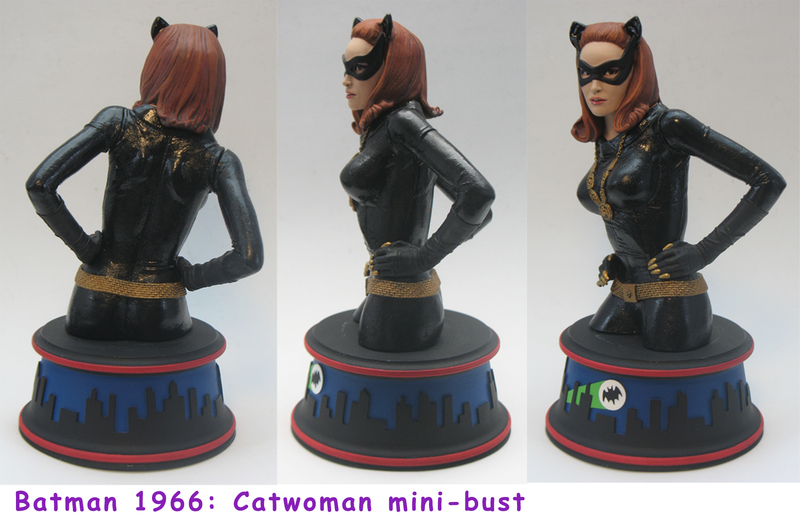 I would like to see all 3 Catwomen portrayed – I would definitely buy a Kiit and/or Meriwether bust. Perhaps a “Miss Kitka” bust for Lee Meriwether.